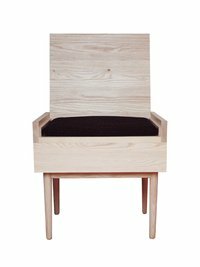 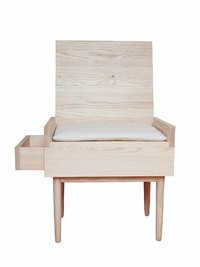 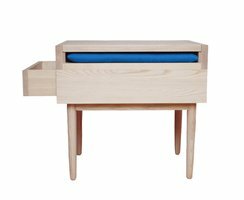 Four sturdy legs are topped by a chest of birch plywood, constructed into a single drawer for storage.The deep frame supports a surface with an upholstered wool cushion, easily covered by a timber panel that folds down by its hinges.The latter component performs well as a chair backrest when upright and a side table top when flipped down.The convertible ASKUR can offer two functions at once and adapt immediately when needs change. 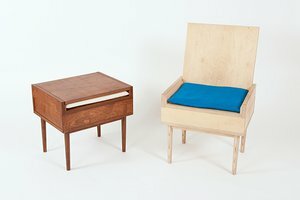 ASKUR can be used as a comfortable chair, side table and it has storage possibilities.With its changeable seat cover you get to choose your own color that suits you and your taste, the light colored birck plywood gives a neutral palette that blends in to its surroundings but can easily be stained with another woodlike colour. 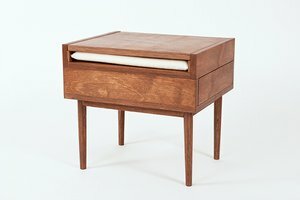 The current model has a teak stain finish. 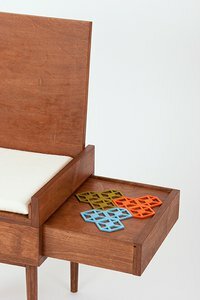 Adjust your furniture to suit your needs!